Whole Wheat Buttermilk Biscuits Recipe -Freezer Friendly! 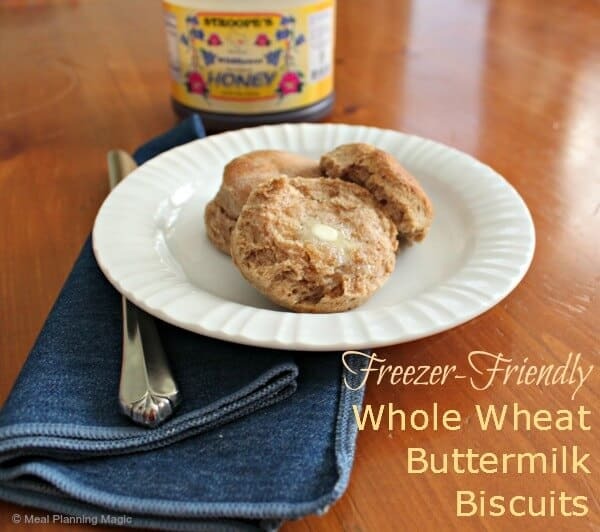 Whole Wheat Buttermilk Biscuits Recipe–Freezer Friendly Too! I think it was probably a summer or two ago when we found the blue bag of buttermilk biscuits in the freezer section of our local wholesale club. I bought them thinking, they must be better than the biscuits from a can. And flavor-wise, I’d say they were. But then I realized they were kind of expensive and probably not all that great for us. But we do love a good buttermilk biscuit. And you know I do love having my freezer filled with quick and easy breakfasts for busy mornings. 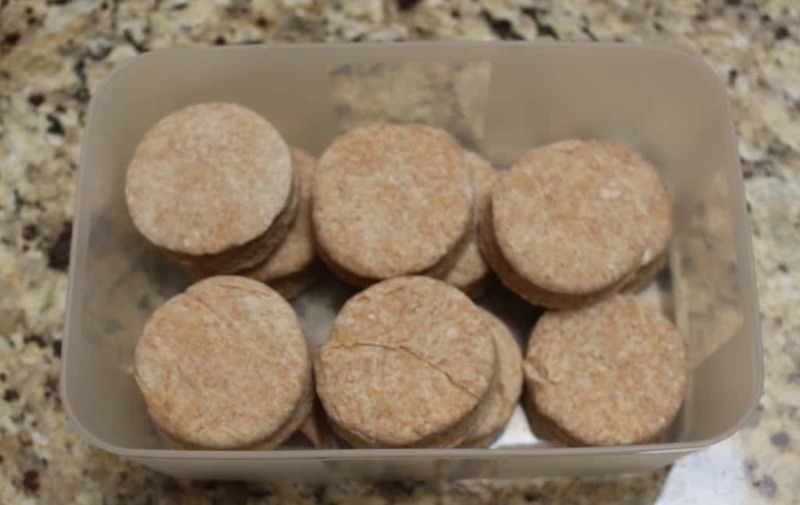 So when I saw these Freezer Biscuits pinned on Pinterest, I knew I must try them right away! Our first batch disappeared in a flash it seems. But I wanted to make them healthier so I substituted half the flour with whole wheat flour. Success! While these Whole Wheat Buttermilk Biscuits do have a slight whole wheat flavor, my family has gobbled them up. I think I’ve made two more batches in just the last few weeks. I know these call for shortening or butter and I’ve been using shortening. My experience with baking biscuits is that shortening helps with the fluffy layers. But I do plan to experiment with the butter sometime soon. I’ll keep ou posted on the results. 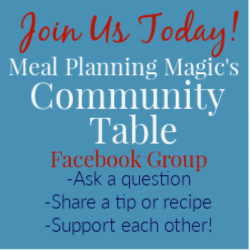 These are just so yummy AND easy, I couldn’t wait to share. Oh! And I did the math on all the ingredients and making them from scratch is exactly HALF of what the pre-made version costs. I hope you enjoy them too! 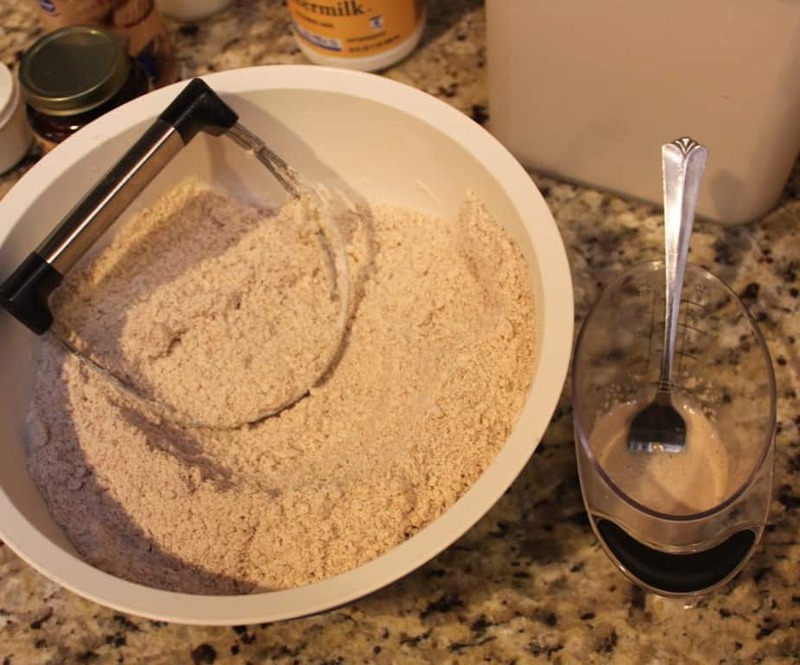 In a large bowl, combine the first five ingredients. Cut the shortening into the flour with a pastry blender or fork until mixture resembles coarse sand. Dissolve the yeast in the warm water. 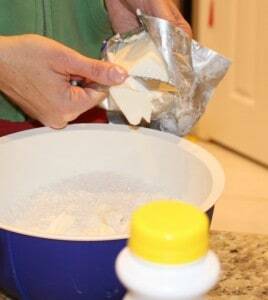 Add both the yeast water and the buttermilk to the flour. Knead the dough until it is no longer sticky and feels elastic. Roll out to about 1/2-inch thickness. 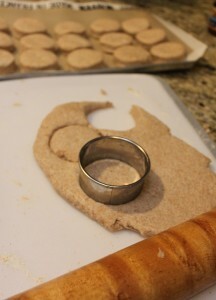 Using a bisuit or cookie cutter, cut into circles and place on a baking sheet. I like to line mine with wax paper or a silicone sheet to help make them easier to remove. Freeze until hard and then place into a freezer container. Don’t forget to label and date your container! I like to put the baking instructions on the label too so anyone can make them. We use our toaster oven to bake up a few. To make, bake at 425 degrees until tops are light brown. 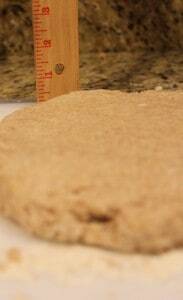 The original recipe says about 15 minutes but I have found it’s about 20-22 minutes for the whole wheat. You can bake these either frozen or unfrozen. If you let them thaw, they will rise a bit because of the yeast. Gather all the ingredients before your start. As you can see, I buy a lot of things in bulk for an organized pantry. I cut the shrotening into chunks before cutting it in with my pastry cutter. Much easier to blend! 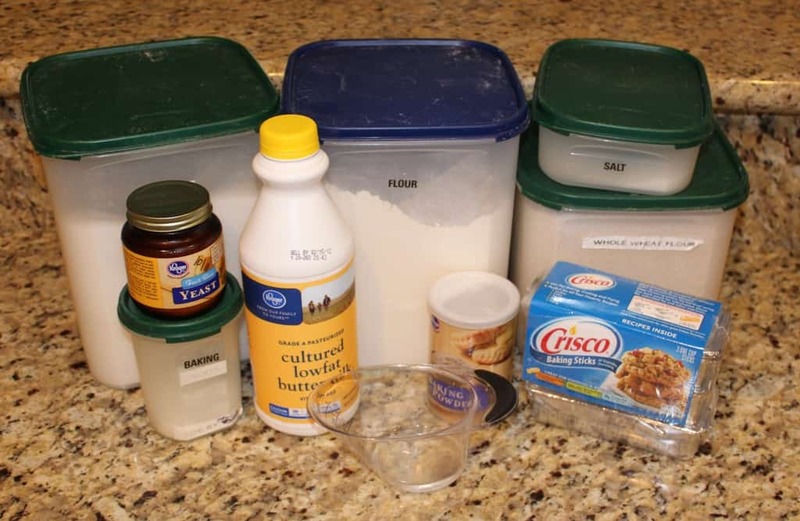 See how the mixture looks kind of “crumby”. Also, I mix the yeast in water with a fork. Doesn’t stick as badly as with a spoon. The first time, we rolled them too thin and they were not as flaky. This time we used a ruler so we knew just how high a half-inch was in dough height. Once the dough is rolled out it’s quick and easy work. I put biscuits on silicone mat on a baking sheet before going in to the freezer. Easier to remove to storage container later. Once the biscuits are frozen, you can stack them in a freezer storage container or bag. 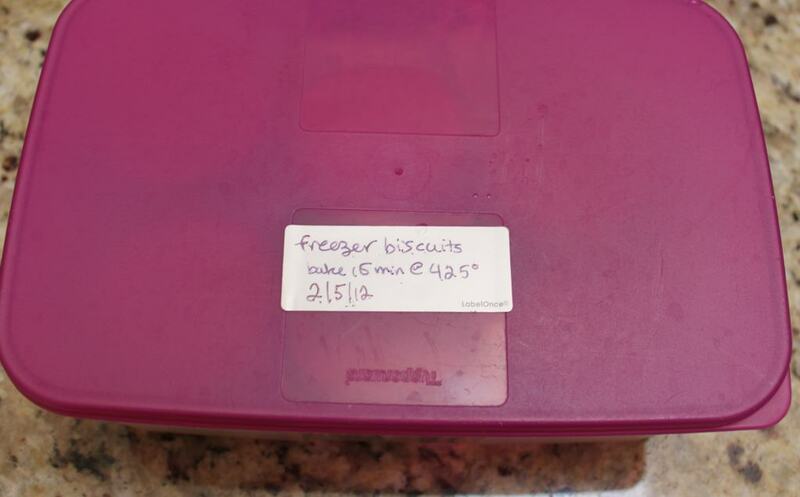 I use reusable freezer labels to write the contents, date and baking instructions on my container which equals easy prep time! 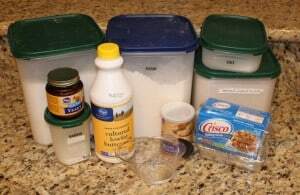 Would it be possible to use 5cups of whole wheat flour instead of using half whole wheat, half all purpose? I’m afraid if you used all 5 cups of flour as whole wheat the biscuits would be too dense and tough. But you could always try it and see how they turn out!